Hall of Fame Promoter Frank Warren is delighted to announce a multi-event deal with the BBC for exclusive radio rights to his World Championship boxing events. The first event on the multi fight deal will get underway this Saturday at Belfast’s SSE Arena, with BBC Radio 5 Live and BBC Northern Ireland broadcasting exclusive radio commentary of Irish boxing legend Carl Frampton’s Interim WBO World Featherweight Championship clash against four division World Champion Nonito Donaire. Further radio coverage on the deal will include live commentary of the IBF World Featherweight title clash between Lee Selby and Josh Warrington at the home of Leeds United, Elland Road on 19th May and WBO World Middleweight Champion Billy Joe Saunders’ Title defence against domestic rival Martin Murray on 23rd June at London’s O2 Arena. Saturday’s Belfast showdown between Frampton and Donaire sees the meeting of two men who were both previously recognised as Fighter of the Year by the Ring magazine, ESPN and the Boxing Writers’ Association of America, and both will be determined to secure a shot at becoming a World Champion once again by claiming the Interim WBO crown. Frampton believes he may have to produce a career-best performance to overcome 42-fight veteran Donaire in front of what will be a sell-out crowd come Saturday. Saturday’s massive evening of boxing also features WBO Bantamweight Champion of the World Zolani Tete (26-3-0, 21 KO’S) making the second defence of his title against Omar Andres Narvaez (48-2-2, 25 KO’s) after his World recording-breaking KO win at the same arena in November. Two-weight world champion has dubbed five-weight world champion Nonito Donaire his greatest opponent as the pair prepare to do battle in Belfast on Saturday. Home fighter Frampton (24-1-KO14) can clinch the WBO interim world featherweight title and book a shot at champion Oscar Valdez by beating the legendary Donaire (38-4-KO24) at The SSE Arena. However, with the ‘Filipino Flash’ having won world honours as a flyweight, super-flyweight, bantamweight, super-bantamweight and featherweight, ‘The Jackal’ is grateful to have enjoyed his “best ever” training camp. 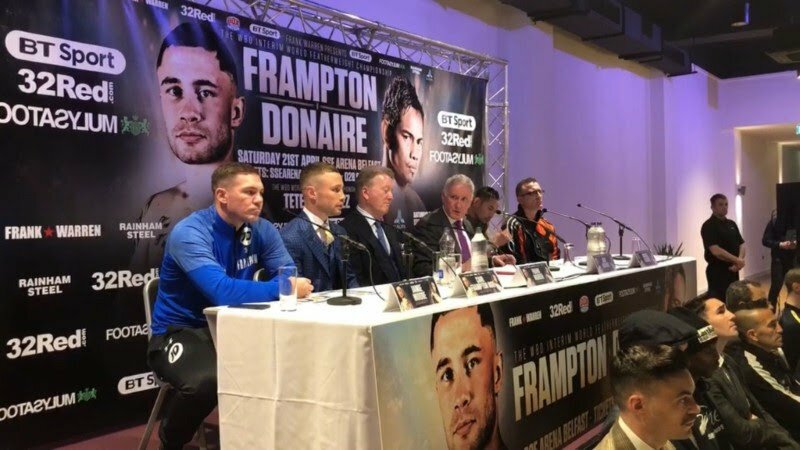 Frampton said: “I know everybody always says this as they go through the motions of promoting a fight, but I’ve genuinely never had a better training camp than this. “I have a lot of respect for Donaire. He’s a quality fighter and has accomplished more than anyone else I have ever fought. “It’s going to be a big thing for me to get the result here on Saturday night. That’s why I trained so hard. I’m lucky to be fighting here in Belfast and bringing Donaire here. It’s an honour. “There is a lot more to Donaire than just a left hook. To say that is disrespectful. He’s also got a brilliant right hand. Donaire said: “It’s great to be here in Belfast. Some people are writing me off as ‘the old guy’ but I feel I’m peaking now both physically and in terms of experience.